We’re excited to announce that Saitek has partnered up with Dovetail Games to distribute at retail a boxed version of the immensely popular Microsoft Flight Simulator X: Steam Edition game. As one of the World’s Most Favorite Flight Simulators, the game enables you to take off from anywhere in the world, flying some of the most iconic aircraft to any one of 24,000 destinations. Plan your own flight in Free Flight mode, or test your flying prowess in missions including Search and Rescue, Test Pilot, Carrier Operations, and more. 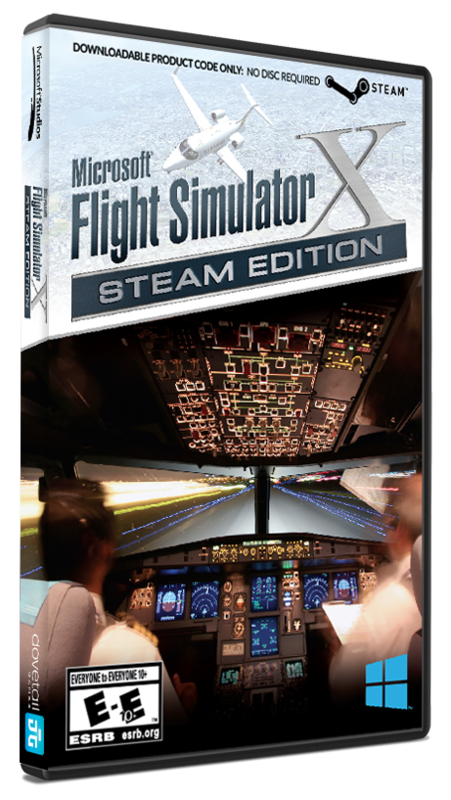 Included in the box is your personal Boarding Pass and Steam Product Activation Code, a Quick Start Guide and a new catalog covering the full range of Saitek’s Pro Flight products. Also included is a 15% off coupon for the First Flight Bundle! Take Control of 24 Meticulously-rendered aircraft ranging from single prop aircraft to fighter jets and helicopters and test your flight skills through over 80 challenging missions around the world. Fly solo offline or compete against friends in thrilling online multiplayer Air Races and explore the world of aviation with weather effects, seasonal changes and time of day all impacting your experience. Boxed version available now. Click here to order.